Since I’m writing from my downstairs computer today, I had to have a new mascot. 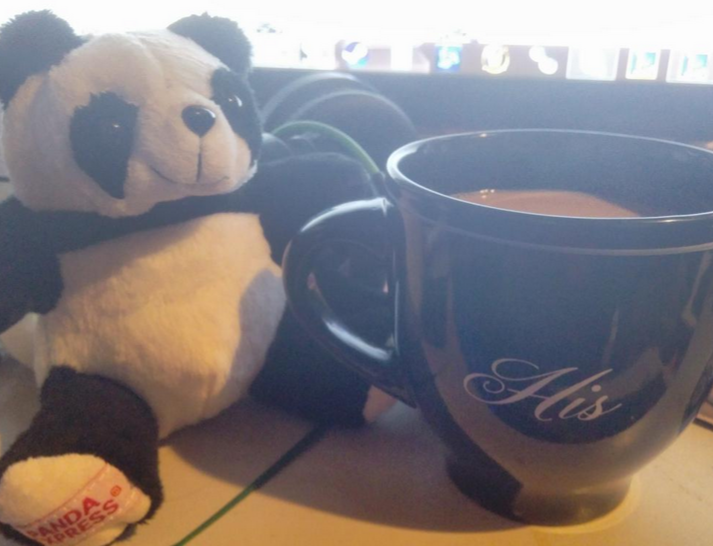 This is my magical coffee panda, who gives me discouraging looks when I drink all of my coffee without having written a single word. Still, it’s always nice to have some kind of mascot, isn’t it? Honestly though, this blog isn’t about everything that I’ve gotten done, or my huge plans. The simple truth is, I’ve been taking a little bit of a slow pace. I’ve been trying to get some things done when I can, make sure that I write a little bit every day. My Patreon is staying updated and my Twitter is getting love… but I have some fairly high stress levels and anxiety right now, so I’m trying to make sure that I don’t push myself into writing something and burning myself out. I think that something important as a writer is to really be familiar with yourself, your mind, your body. You need to know when enough is enough. We live up to these expectations of so many words a day, so much writing a day, write every day… and they’re amazing expectations. They’re fun and wonderful and good for us to have goals… but it’s also important to watch your mental health. My stress comes from the fact that I’ll be taking my first trip to Kentucky since I left four years ago within the next two weeks. I’m going to go and see my mother (who I’ve told you all about her and the illness issue), and it’s really getting my anxieties up. I haven’t been there in a while, and a lot of the negative things that happened in my life happened there. I am beyond excited to go – to see the people I love… but that stress is still there. It’s still real. As a writer, respect your mind, your brain, your emotions. Don’t make excuses – don’t be like, “Oh, well, I had a bad day because I wore purple instead of blue! I can’t write!” That’s silly. But if you’re legitimately going through something, don’t push yourself. Let writing be your outlet when you need it, but don’t force a story that isn’t there. That’s all the advice that I have for you guys today. I still have quite a few book reviews to get up, more to come, and some more blogs with tips and tricks. If you guys want to see anything specific, let me know in the comments! I love hearing from you!